The general perception of Sherlock Holmes is that he was a man of impeccable observation and droll sensibilities, often wandering through his story arcs with tongue-in-cheek self-awareness. His legend is embellished further by rather silly devices of presence: a deerstalker hat that was traditionally worn by men in hunting parties, and a long pipe that was as absurd as it was overkill. To any who might have read any of Sir Arthur Conan Doyle’s yarns about the British detective and his loyal sidekick Watson, his was a persona that leapt from the pages as if a cartoon trapped in live action backdrops. And yet we admired him tremendously in spite of his more zany values, mostly because he legitimately was good at what he did, and we believed he did it all for the sake of bettering the world. Those core qualities are replicated in the underlying narrative current of “Mr. Holmes,” but something starker has crept into those realizations. Old age changes men as fast as the tide changes a shoreline, and what once was the visualization of an all-knowing detective has become a portrait of a frail man seeking penance for wrongs that seem to cast ominous shadows. There are various other misconceptions – even besides the hat and pipe – that Holmes hopes to correct throughout the course of this movie, but obstacles litter the path. His memory fades in and out, causing recollections of famous cases (or significant encounters) that may or may not be fictionalized. He spends the majority of the film not in his study on Baker Street, but rather in a cottage in the country tending to beekeeping, all while being watched over by a simple but observant caretaker (Laura Linney). A friendship develops between the aged sleuth and the caretaker’s young son Roger (Milo Parker), but their bond is undermined by silent realizations that Holmes, now old and limping through existence, is rapidly disappearing into the fog of mortality. What does he have left to say that keeps him so stubborn in the thrushes of this reality? All he can recall is that his last case as a detective went unsolved, and through the confusion he hopes to find answers that will give him some semblance of peace. Because, after all, a master of his craft is, perhaps, only as good as his final act. “Mr. Holmes” is a movie about regrets and realizations, an essay on the human identity in which a figure we have come to recognize as immortal is brought off the pages of a book and into the sphere of a finite existence that can be cruel, confusing and often filled with paralyzing loneliness. That does not necessarily imply that the movie is an exercise in melancholy, but plausible sentiment must often evolve from pain, and here is a surprisingly sincere endeavor that comprehends those facets without relegating them to conduits for schmaltz or melodrama. Rare among small pictures, it also possesses a sense of perspective that surprises as easily as it engrosses. We have seen countless movies about men and women struggling to find meaning in the last days of their complex lives – several, I would wager, have been cinematic benchmarks – but few times do we see them in this window of irony, and all concerning the identity of someone we thought we knew so well through literary perspective. Ten minutes into the movie is all one needs to realize just how off-base we are in our perceptions. It is the era of postwar Europe, and old Sherlock is staggering through the aftermath of his now-famous career of British crime investigations. He is played by Ian McKellen in a manner that only McKellen could convey: as a noble spirit of sarcasm and wit whose eyes seem to echo colder truths. Towards the open of the picture, there is a scene when he spies an inquisitive child on a train investigating a wasp on the window. His retort: “you aren’t going to tap the glass now, are you?” It is exemplary for such a moment to be used in this context, if for no other reason than to emphasize the natural skills of the protagonist: here is a man who may be old and forgotten, but still possesses a talent for details that give him an almost clairvoyant edge in casual interactions. That edge, naturally, also comes with the typical Sherlock wit and reasoning, which propel the rest of the material. 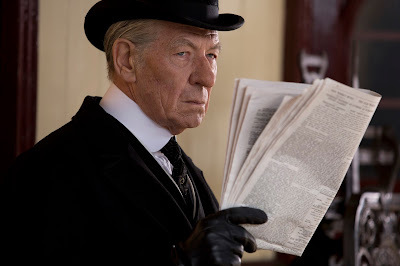 The plot involves Mr. Holmes travelling to the countryside, where he can be monitored by the kindly Mrs. Munro (Linney) while he watches over beehives and writes in a journal about his last days as a detective. This facet piques the interest of young Roger, a boy that snoops eagerly in his upstairs foyer for pages filled with ominous clues. What he sees in them that is so fascinating, perhaps, comes completely down to the notion that Holmes himself is writing them from first-hand accounts; in this screenplay, all the well-known Holmes yarns were penned by Dr. Watson, and his trusted sidekick often embellished details for literary affect (the deerstalker hat, as an example, was simply an invention of a vivid imagination). An opportunity to hear about something directly from the horse’s mouth – especially this horse – presents a unique opportunity of insight for young Roger, who peruses the words and picks up on cues like an understudy rather than a student of the Holmes doctrine. Their relationship is a sweet display of synergy, and provides the film with its greatest sense of emotional insight. Inside that elusive journal are the beginnings of a story involving the Sherlock’s final case on Baker street, one which effectively ended his career and sent him into self-imposed exile. The incident involved an investigation into the strange behavior of a socialite wife (Hattie Morahan), whose children died from miscarriage and caused her to wander through a strange existence that confused even her husband. We see much of the case unfold in flashback, but only in fragments; Holmes’ mind has lost important clues, and through triggering details in a subplot involving a recent trip to Japan, he struggles to reassemble the specifics in hopes of understanding what exactly transpired. Is it possible that his mind has intentionally blocked it all out? That is a question that is as obvious as it is enlightening, especially when it becomes clear that Holmes possessed a very strong bond with the woman he followed, and even now still clutches her picture as if some kind of fetishistic totem. The director of the movie is Bill Condon, a fact that plays like an epiphany when one considers how familiar the material is to “Gods and Monsters,” another film he made that also starred McKellen as a dying figure of importance. While that picture resonated on the basis that it took big risks with specifics, however, “Mr. Holmes” plays things much safer than that; we are left with the impression that the screenplay is only so eager to tamper with the image of Sherlock Holmes, and just enough so that purists won’t raise significant objections. Additionally, some of the peripheral concepts (like the beekeeper angle) only seem to exist for the sake of setting the stage for more menacing developments in the third act. The problem, alas, is that the film really doesn’t need them. Between the poignant relationship shared by Holmes and Roger, and the reverence created by the opportunity to see this character towards the final curtain of his illustrious life, the film already possesses a conviction of tangible values. These added scenarios detract, I think, from the power of the performances, in a picture where the most moving details are stirred from realizations rather than knee-jerk twists. I was fascinated and moved by much of “Mr. Holmes,” but I wasn’t entirely riveted by it, either. There are tremendous accomplishments going on throughout the course of the picture, mind you; the depth of the acting is on-target, the dialogue is smart, and the relationships between key characters are filled with poignant undercurrents. But it’s hard to care about some of the scenarios thrown at the screen, especially given how audacious the premise already is in reinventing the image of the famous detective. Why not just go all the way with it? Why leave us with a third act in which a shocking situation requires him to piece things together as if back in the field? Condon and his writer Jeffrey Hatcher are clear in their motives (sure, it’s easy to see this twist as a way of Holmes finding peace with his situation), but their execution disrupts some of the dramatic momentum. By the end, we are no less interested in the dying Sherlock as a compassionate and self-aware person, but somewhat regretful that some of his final days must be spent contemplating the differences between bee and wasp stings.